On Monday 9th July, the London 2012 Olympic Torch Relay – presented by Coca-Cola, Lloyds TSB and Samsung – will travel 112.32 miles through 15 communities on its journey from Luton to Oxford. The Relay will travel through the following communities: Luton, Dunstable, Milton Keynes, Bletchley, Buckingham, Winslow, Whitchurch, Aylesbury, Stoke Mandeville, Waddesdon, Bicester, Kirtlington, Woodstock, Kidlington and Oxford. 6.36am – Lewis Hamilton is set to carry the Olympic Flame as the Torch Relay sets off from St Georges Square in Luton. Lewis is one of fastest men on four wheels and has become one of Britain's most iconic drivers in Formula One's history. He became World Champion in 2008, his second year in Formula One. 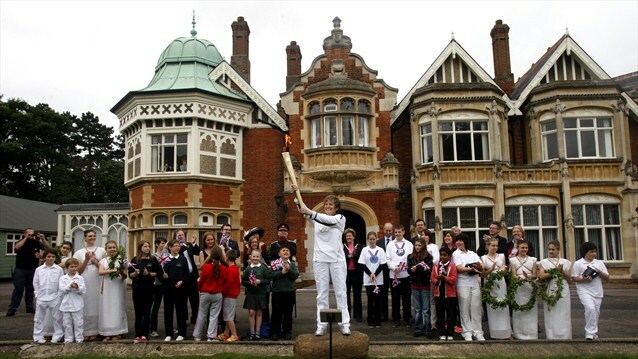 9.18am – Jessica Stalley, 16, from Bedford, will carry the Flame into Bletchley Park and in front of the house she will hand the Flame to Hazel Staten, 57, from Milton Keynes. Jessica was nominated through the LOCOG public nomination campaign for the way that she coped with having an operation to straighten her spine and her aspirations to compete in the Paralympics. Hazel was selected through the Lloyds TSB campaign for the way she fought and won the battle against leukaemia with a life saving bone marrow transplant from her brother. 12.43pm – Gemma Collis, 17, from Aylesbury, will carry the Flame at Stoke Mandeville Stadium in Aylesbury. In the centre of the stadium she will hand the Flame to Ian Estick, 44, from Milton Keynes, who will then carry the Flame out of the stadium. Gemma was nominated by Sport England for her courage and determination in coping with a condition called Reflex Sympathetic Dystrophy (RSD). She volunteers at a range of events from school festivals to the UK School Games and World Wheelchair Basketball Championships. She has taken up Wheelchair Basketball and has been selected to play for the U25 Welsh Wheelchair Basketball Team. Ian was nominated through the LOCOG public nomination for the work that he does with his charitable trust that he set up following the sudden death of his 23-month old son, Daniel. 3.44pm - On the approach to Blenheim Palace, Roland Read, 61, from Wheatley will pass the Flame to Graham Warland, 64, from Banbury with the Grand Bridge in the background. Roland has run a Karate club for more than 30 years and was nominated through the LOCOG campaign. Graham’s passion is canoeing and he competes regularly in flatwater racing competitions. He was nominated through the Lloyds TSB campaign for his success in the sport and his work managing the Banbury & District Canoe Club. 3.57pm – Juliet Sparrow, 18, from Blakesley, will carry the Flame to the front of Blenheim Palace. On the steps she will hand the Flame to Patricia Pearce, 67, from Great Missenden. Juliet was nominated through the LOCOG public nomination campaign for her courage and determination to overcome her broken back, which happened while she was trekking in Costa Rica to raise money for charity. 6.50pm – Malcolm Fretter, 67, from Wantage who was selected through the Coca-Cola campaign for his teaching and voluntary work will carry the Olympic Flame on to the stage at the Evening Celebration. The evening celebration will take place in South Park, Oxford. The evening celebration event begins at 5pm and will feature a variety of entertainment staged by LOCOG and the three Presenting Partners of the London 2012 Olympic Torch Relay - Coca-Cola, Lloyds TSB and Samsung - with support from Oxford City Council. Young Guns will perform at the Evening Celebration. A dance troupe will also provide a unique fusion of street performance, theatre and sport and there will also be a performance from dance act Twist and Pulse. There will also be performances by local acts. Towards the end of the two-hour show, the last Torchbearer of the day – Malcolm Fretter - will light a celebration cauldron on stage at the event which will enable the Olympic Flame to be seen by the audience. Nominated through LOCOG’s public nomination campaign - Rebekah Wagnell, 16, from Milton Keynes, will carry the flame in Aylesbury. Rebekah is a total inspiration, born with chronic renal failure and battling poor health throughout her childhood, at times desperately ill, she always had hope that she would be better and was a real encouragement to everyone who visited her and even on the really rough days always had a cheeky smile for everyone. When she was 9 she markedly deteriorated and, a year later in 2006, she received a kidney transplant from her Dad. That was 5 years ago. Last week she came back from the 18th World Transplant Games with 3 silver and 2 gold medals in the swimming events. Gail Emms, 34, from Hitchins, will carry the Flame in Milton Keynes. Badminton Olympic silver medallist Gail Emms, selected by Lloyds TSB because of her contribution to her sport and inspiring young athletes through his support of Lloyds TSB National School Sport Week. Nominated through LOCOG’s public nomination campaign - Neil Heslop (OBE), 47, from Beaconsfield, will carry the Flame in Aylesbury. Neil was a very talented rugby player at a young age however in his early teens he was diagnosed with retinitis pigmentosa and lost a substantial amount of his field of vision. In the first year of his degree at Newcastle University he completely lost his sight. Undeterred he took 6 months out to learn Braille and returned to University to complete his law degree. He then pursued a career in telecoms after leaving university and in 1991 undertook an intensive one year MBA at Cranfield which had never been done before by someone who was blind. In 1992 he founded a national charity Blind in Business to help blind youngsters into employment. The charity has raised several million pounds since its inception and each year now helps more than 100 blind graduates into jobs and works with many schools for the blind in the UK in raising employment expectations. In 2002 Neil was awarded an OBE for his services to charity and to telecoms.